VIVA LA RAZA! VIVA LA CAUSA! 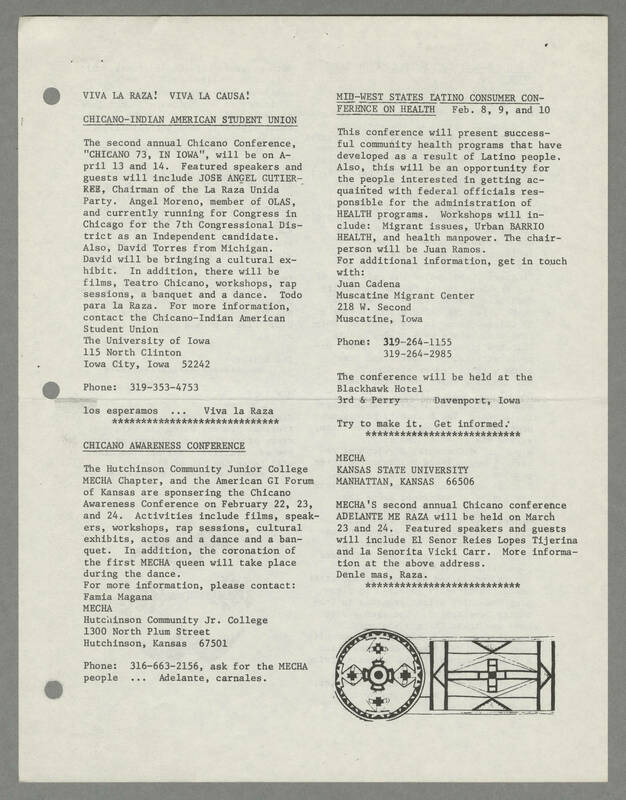 [[underline]]CHICANO-INDIAN AMERICAN STUDENT UNION[[end underline]] The second annual CHicano Conference, "CHICANO 73, IN IOWA", will be on April 13 and 14. Featured speakers and guests will include JOSE ANGEL GUTIERREZ, Chairman of the La Raza Unida Party. Angel Moreno, member of the OLAS, and currently running for Congress in Chicago for the 7th Congressional District as an Independent candidate. Also, David Torres from Michigan. David will be bringing a cultural exhibit. In addition, there will be films, Teatro Chicano, workships, rap sessions, banquet and a dance. Todo para la Raza. For more information, contact the Chicano-Indian American Student Union The University of Iowa 115 North Clinton Iowa City, Iowa 52242 Phone: 319-353-4753 los esperamos ... Viva la Raza [[underline]]CHICANO AWARENESS CONFERENCE[[end underline]] The Hutchinson Community Junior College MECHA Chapter, and the American GI forum of Kansas are sponsering the Chicano Awareness Conference on February 22, 23, and 24. Activities include films, speakers, workshops, rap sessions, cultural exhibits, actos and a dance and a banquet. In addition the coronation of the first MECHA queen will take place during the dance. For more information, please contact: Famia Magana MECHA Hutchinson Community Jr. College 1300 North Plum Street Hutchinson, Kansas 67501 Phone: 316-663-2156, ask for the MECHA people ... Adelante, carnales. [[underline]]MID-WEST STATES LATINO CONSUMER CONFERENCE ON HEALTH[[end underline]] Feb. 8, 9, and 10 This conference will present successful community health programs that have developed as a result of Latino people. Also, this will be an opportunity for the people interested in getting acquainted with federal officials responsible for the administration of HEALTH programs. Workshops will include: Migrant issues, Urban BARRIO HEALTH, and health manpower. the chair-person will be Juan Ramos For additional information, get in touch with: Juan Cadena Muscatine Migrant Center 218 W. Second Muscatine, Iowa Phone: 319-264-1155 319-264-2985 The conference will be held at the Blackhawk Hotel 3rd and Perry Davenport, Iowa Try to make it. Get Informed MECHA KANSAS STATE UNIVERSITY MANHATTAN, KANSAS 66506 MECHA's second annual Chicano conference ADELANTE ME RAZA will be held on March 23 and 24. Featured speakers and guests will include El Senor Reies Lopes Tijerina and la Senorita Vicki Carr. More information at the above address. Denle mas, Raza.